We watched Reboot religiously when we were kids. We recorded episodes and watched them over and over again. I was recently reminded of the series, so I went back and watched through all of it again. Say what you will about the dated graphics, they knew how to tell a story. Maybe the third beer was having an effect, or maybe I was just hit with a wave of sentimentality, but I started drawing my versions of these now iconic characters. I got so into it I stayed up scrawling under a single lamp until I crashed at 3am. Redesign the characters to enhance their role in the narrative, while maintaining the strong, simple graphic language. Enzo – Chaotic good. He’s young, energetic, and undisciplined. Shirt un-tucked, hair a mess. He was raised by his sister after his scientist-father died (he still refuses to take off his father’s lab coat). He craves action and adventure, and rarely touches the ground. The kneepads come in handy frequently. Mouse – Chaotic neutral. She’s a mercenary with special talents. She’s a hacker, an escape artist, an infiltrator. While she’s learned to look out for number one, Bob’s natural charisma is making it hard for her to resist caring for his cause. I made her smaller, like a mouse. The hood helps her seem more guarded, more thief-like. She’s a little harder to trust. In the show she has vibrant orange hair. Since I don’t know why the did that (stylistic whim?) I decided to make it a darker version of her skin like Dot and Enzo. I put the orange in her hoodie instead. Bob – Chaotic good. Guardians are like a military organization. Bob is a young member, spontaneous, reckless, and a radical thinker. His charm has been his best asset, though his guardian key tool “Glitch” comes in at a close second. I put him in a uniform, but he’s not too particular about regulation. I made Glitch a full glove because in tough situations it is Bob’s right hand. Literal, thy name is Matt. Bob’s seemingly careless attitude. I wanted her to dress as cleanly and sharply as possible. Her hair is pressed down. She’s trying to keep everything in order. Megabyte – Lawful evil. The viral strategist. He plots, he schemes, he watches his diabolical plans unfold from his tower fortress. While he is physically capable, he prefers not to get his hands dirty. He’s still an imposing figure, but I toned his bulk down a little, gave him a regal (rather than animalistic) pose. I love the hip-sphere, and his head fins. Those two elements were too good to loose. Megabyte has always been a favorite of mine so I couldn’t change those elements. For him and Hexadecimal I came up with a reverse fade color scheme. Blue and red, but inverted for each. They share the same genes, but they are worlds apart. Again, literal, but to me those designs end up giving the most payoff. Hexadecimal – Chaotic evil. Megabyte’s viral sister. She represents destruction, havoc, anarchy. Life and death are just as good, as far as she’s concerned. I made her crown more twisted, and gave her some of Megabyte’s anatomy (they are related, after all). 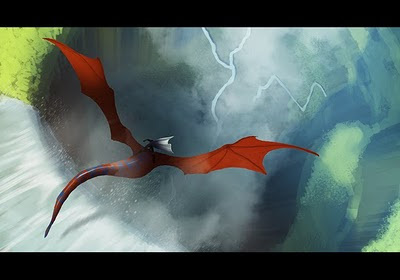 I saw "how to train your dragon" and loved it. Some of the flight scenes were exhilarating, like those all-too-rare flying dreams. This is an attempt to get some of that feeling of vertigo and exhilaration in an image. Might try a few more versions later.